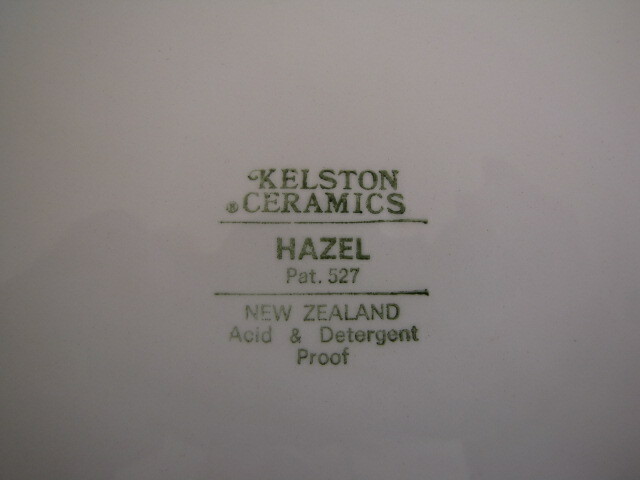 I've seen this pattern listed on Trademe, but have never come across a piece in my travels. 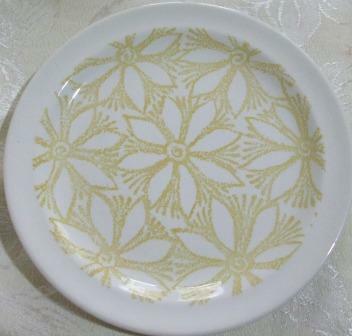 Oddly, I have the same pattern on a saucer and it's called Clematis! 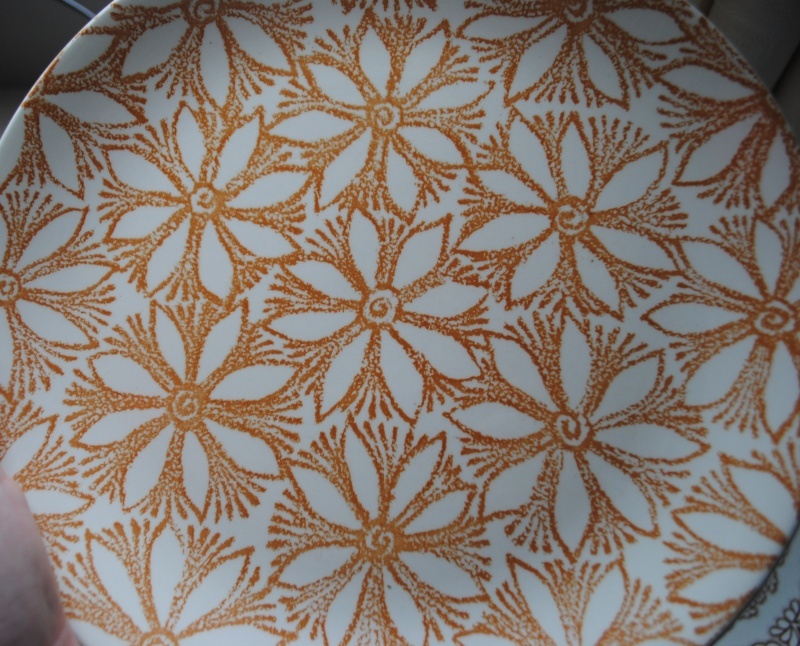 There is also a pumpkin colour in this pattern as well, though I don't think I know the pattern name? Think that I've seen a yellow one too ...? I definitely had the colour your picture had on an Apollo bowl. I would swear it wasn't called Hazel. I do still have two saucers with the pattern going right to the edge as per your photo though. So confusing when they have similar patterns with different names! Is it the cup you want or a picture for the patterns gallery? I have some plates in the orange version, which I guess is pumpkin. 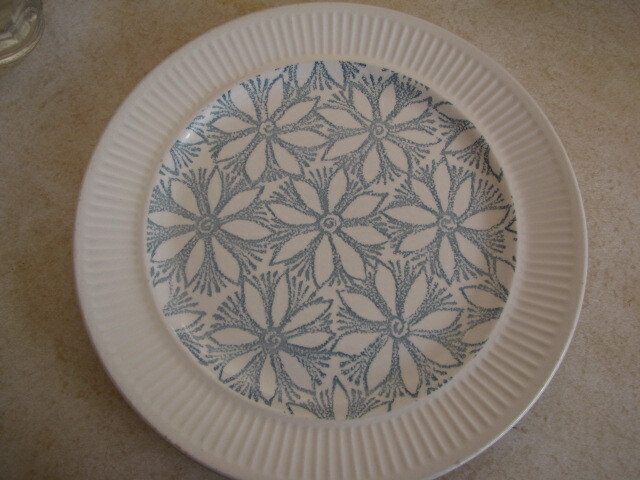 It's the plate with the orange clematis pattern that we are after Jeremy. Though now I will have to try and find the names for these other ones. Yes it is the right colour, though I had to remove the photo as it breaks copyrights. The link works fine though. Yes Tan is the orangey colour. You have to get used to their terminology and I prefer to use it now. I still have a list of patterns to sort out and will ask for your help. I will be going to the Museum again shortly, now that all of the festivities are over. Ev.. from looking at the paperwork yesterday, I have seen a few that I can name... shall I PM you, with a list? Think so... but I would like a second opinion LOL - I want to understand the numbering system for glaze colour's first and double check that I have the correct shape plate.. I think I am onto it, but just want to be sure. Oh wow, there is nothing to alert me to messages in the Galleries. I only find them by accident or if the poster alerts me to them. It's actually better to ask questions in the main forum where everyone can find them. 3050 and 3051 can be found in the pattern records, but I haven't found any difference between them. They are posted in the cups/mugs topic. Oh wow, at last somebody else thinks that the 832 is the so called fat bottomed cup. 832 ..... just says obsolete .... which would have been added later and I don't think that shape was made after 1964 when the four digits came in.... do you? 859 ..... records say small coffee cup which means it could be the small fatbum!!! 832 is pre 1964 - I think it could be the yellow check one. But the colour shows 435/4 - which is the same green colour that Galatia and Spring-wood uses. I found two Hazel plates yesterday.... didn't need them as we already have the pattern, but I just can't help myself when it comes to pristine hardly used Crown Lynn. Is it an obsession? Truthfully I would like to get every bit of Crown Lynn dinnerware that I set my eyes on and store it like Gollum and his treasure!! I have so many fights with my ego about this it's a wonder people can't hear me arguing with myself about it in opshops! Do I know that feeling!!!!!!!!!!!!!! !